An unemployed submarine pilot assembles a crew to steal Nazi gold from a sunken U-Boat. In the late 50s, Hollywood studios, terrified of the burgeoning threat of TV, began to focus their attention on mega budget, epic spectacles. This left a gap in the market that was filled to a large degree by independent British productions like the horror films of Hammer. Forward to 2014 and we're seeing a similar situation, with Hollywood once again attempting to compete with TV by producing movies with insanely large budgets, while showing a reticence to fund lower budgeted genre movies. With Hammer reborn, it seems it may be time once again for the British film industry to step up and give us the sort of movies Hollywood is no longer interested in furnishing us with. Black Sea is exactly the sort of movie Hollywood has turned its back on - an old school, spam in a can, guys on a mission movie. Armed with a not so convincing Scottish brogue, and with a few extra pounds giving him the appearance of a young Phil Collins, Jude Law is Robinson, a gruff submarine pilot who finds himself jobless and obsolete. 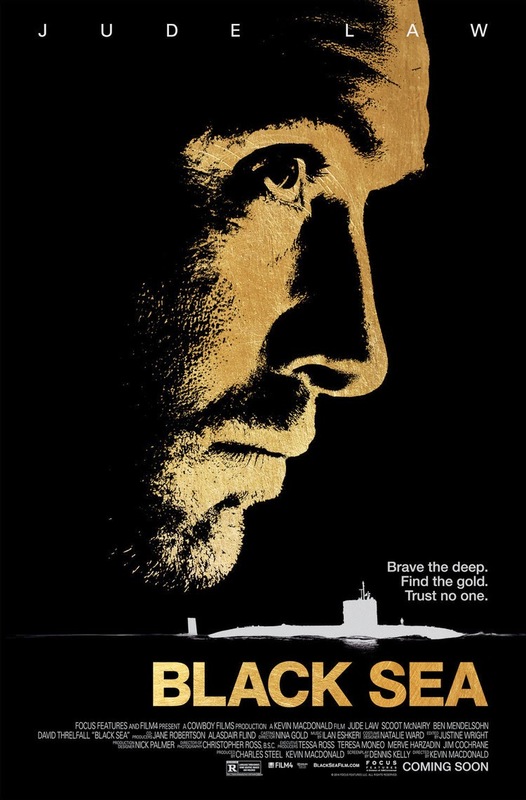 When an old colleague tells him of a stash of Nazi gold lying in a U-Boat at the bottom of the Black Sea, Robinson, through American intermediary Daniels (McNairy), meets with a multi-millionaire who agrees to fund the illegal expedition for an agreeable 40% cut. When Robinson assembles his half British, half Russian crew, we're firmly into Sunday afternoon genre movie territory. It's no coincidence that the crew consists of 12 men, and they make for a particularly dirty dozen, men who are quick to admit their failings in life above the surface, but masters of their trades below the waves. Tensions arise when sociopathic diver Fraser (Mendelsohn, referred to as a Brit, but very much sporting his native Aussie accent) expresses his distaste at the idea of the Russian crew members receiving the same cut as the Brits. As the nervy Daniels points out to Robinson, the less men who make it back, the larger everyone's cut will ultimately be. Given the reputations of some of the narcissists onboard, this makes for a tense, paranoid trip to the dark depths of the big blue. Director Macdonald does an effective job of conveying the claustrophobic tension of this premise, his camera roaming the tight corridors of the submarine in a way that recalls, as does the male dominated milieu of the film, John Carpenter's The Thing. James Cameron's Aliens is clearly an influence also, as McNairy's slippery company man is practically a carbon copy of the character played by Paul Reiser in the earlier movie. As with most of Macdonald's films, there's an attempt to ram a political message down our throats. In his under-rated 2011 Roman era drama The Eagle, he managed to subtly comment on modern American intervention in the Middle East by casting unaccented American actors as the Roman soldiers, but usually his political grandstanding is far broader, as is the case here, with Law making several speeches on the tired old theme of the working class being screwed over by those in power. There's something hypocritical about the socialist message here, though, as while Robinson may be splitting the gold equally between the men, he's still obsessed with becoming rich. Thankfully, the confused political message doesn't slow down what is an enjoyable, old school genre piece, elevated by a fantastically assembled cast of international character actors.